Jackie won the Cheerios "Do What You Love" giveaway! Sandra won the BusyBodyBook giveaway! Both winners have been confirmed. 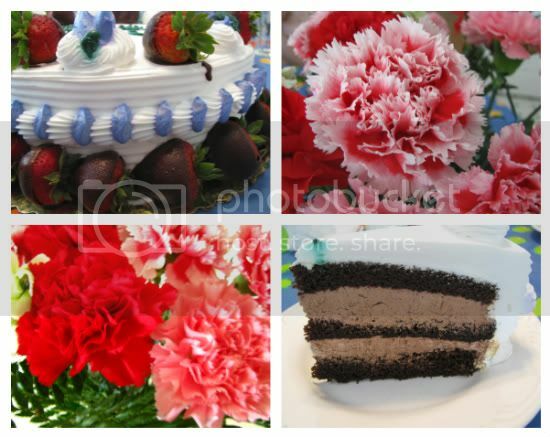 Yes, they brought me carnations (my favorite flowers) and what just might be the perfect cake: chocolate cake, chocolate mousse filling, whipped cream frosting, and chocolate covered strawberries. DH arranged it so that I didn't have to cook for three whole days. I am so blessed. What a beautiful cake! Sounds like a nice birthday! WOW! You were definitely spoiled. I am so glad that you had a nice birthday. Happy birthday!! That cake looks fabulous!! Happy Birthday sweetie you really have an amazing hubs! What a blessed day to just hang with the family. That cake looks so yummy!!! I love to hear what you're thinking, so thank you for leaving a comment! Spammers are unwelcome here, and spam comments will be deleted. Recipe Weekend: Recipe for Happiness?